I received an unspeakably great honor recently. I was at a bible study with folks less than half my age, unchurched folks. After the study, we began to pray, and the shaggy, pierced kid to my left began to pour out his heart to God. He was declaring his love, and at the same time, asking God’s blessing, He was doing it in his native language. And his native language was thick with four-letter words. Immediately, something rose up inside me: I was offended! But just as immediately, Father drew my attention to the heart that was pouring out that stream of “profanity.” Quickly, I saw it from His perspective: how tender, how sincere, how transparent, how beautiful. I felt Father’s joy, delighting in that prayer which offended me so badly. And I began, just barely began, to understand, and as I did, tears formed in my eyes. This was “love from a pure heart, from a good conscience, and from sincere faith.” (1 Timothy 1:5) This was exactly what he was looking for: someone worshiping him “in Spirit and in truth.” God was delighted with this prayer from his beloved son! 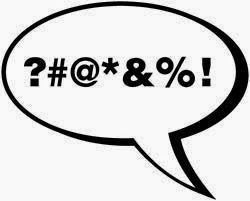 And I’ve had to admit: “cuss words” are just noises. It’s the heart behind them, it’s the intent, that gives them meaning. God is not offended by noises. Maybe I shouldn’t ought to be either. Now, having said that, having rejoiced at being present at such an intimate outpouring of love in four-letter vocabulary, I should probably add: this isn’t my language; it doesn’t justify my using that fellow’s language to communicate, either with God or with man. Whenever I bring this topic up, there’s always someone who angrily responds, “But the Bible says to not use filthy language!” And it does, but in the same sentence it says to put off anger. Hmm. And anger is also encouraged, even commanded (Ephesians 4:26). Hmmm again. Maybe this isn’t as “black & white” as I thought. The word for “filthy language” here is “αἰσχρολογία,” which is literally “αἰσχρός [aischros] words.” And aischros words are words that are dishonoring, shameful: he’s speaking about the heart (no surprise there), not about the sounds coming out of the larynx. Aischros is also the “filthy” part of “filthy lucre” which is more commonly translated “dishonest gain.” Again, the command is not about certain sounds, certain noises, that are off limits, but the heart behind the sounds. We foolishly think that as long as we don’t make those particular sounds, we can tell people off (perhaps in Facebook comments? ), we can cut people off in traffic, point out others’ mistakes, tell shady jokes and leave lousy tips. All of these are violations of the same intent: dishonoring, shameful, dishonest gain. 1. Is this practice profitable? 2. Is this practice mastering me? 3. Does this practice edify or build people up? In the case of four-letter vocabulary, asking these questions – particularly as they relate to the next generation – gave me some surprising answers. I’ll get different answers, of course, when I ask them related to churchgoers, but I expected that. But then he suggested to me: “Now ask these questions about the practice of correcting other people’s four-letter vocabulary.” Oh my. That one failed all three. I find myself drawn to these conclusions: Four letter vocabulary is not my language, but I’m not going to condemn myself over my language choices when I hit my thumb with a hammer. And my offense at others’ use of a language that is not my own appears to be far more offensive to God than either their language or mine.